Enjoy taking a shower with the jets on. The six fully adjustable body spray massage jets, rain showerhead, hand shower and tub spout on the VIGO Mateo Shower Massage Panel have the power to transform your everyday shower into a spa experience. The hot and cold thermostatic valve control lets you adjust the water flow without having the temperature change. Panel is pre-plumbed for easy installation. Dimensions 1.0 In. X 7.13 In. X 59.5 In. My wife and I were trying to achieve a spa like feeling when we remodeled our master bath and this unit was exactly what we were looking for. I wasn't sure as to what to expect when I opened the box but what I discovered was a substantial piece of hardware that was perfect for our Vigo shower enclosure. Quality is exellent and installation was simple(per our contractor). The rain shower and jets give our shower a resort like feel. I would highly recommend this product! Excellent design, easy install, everyone that sees it has a comment. Love that each spout (shower, body sprays, hand shower) can be used together or separately. Even the strange tub filler is useful when filling a mop bucket. Has internal mixing valves which is different and helps with the easy install. However I feel like the water doesn't get as hot as with my standard valves. (It's not the water heater etc because the tub right next to the shower gets hot) Even the temperature valve doesn't change the temperature, so we leave it on as hot as it can go and we have the same boring warm shower every day. <--That's my only complaint. Overall, the shower panel is an excellent value. Easy to install and operate, powerful jets with the supply water very evenly distributed between the three different functions. The only reason for the lower rating on quality is due to the fact that the inner piping is visible at the lower tub filler spout from the side view. Granted, this is extremely low, so the only one seeing this is probably my cat, but for a piece of this price and quality, I would have expected all the supply piping to have been concealed. I would definitely recommend this to a friend - and have even purchased a second one to use for myself. Very nice shower - love it. I've had this shower for about 2 years now. My wife and I both love it and are very happy we purchased it. It's easy to install but does require to modify plumbing from a conventional shower fixture. It's best to install this fixture when doing a full tile renovation. I did have a problem with the temperature balance control after about 6-8 months but Vigo was very helpful resolving the issue. They are great company to work with. I will definitely consider their products in the future. One issue to understand when buying a stainless fixture like this is that you need to wipe it down after each use to prevent hard water marks. I wanted an update shower without having to reroute a bunch of plumbing and this has been amazing! Be careful on installation or taking out of the box/moving around. Mine had one of the hoses pinch and it restricted the hot water flow. It was easily resolved directly with Vigo - they were great with any questions too! When I received this I was thoroughly impressed. It was sleek, clean, modern looking; about to make a real statement in our remodeled bathroom. Alas, we were sadly disappointed in the performance. Our plumber explained that the low water pressure had to do with a combination of small hoses and the fact that water was routed through an extensive amount of hoses. Even the tub spout ran poorly, taking up to 45 minutes to fill our tub! Additionally, there is not a piece of metal casing that wraps around the bottom so you can see the nuts/bolts behind the tub spout from a side view-most unattractive. I called the manufacture about that and they said their only solution was that I should consider using it in a corner installation. What's the point of that when they claim it can also be flush mounted?! Long story short, we returned it. Note: if you're planning on trying it out, keep your packaging until you are VERY sure you're keeping it. I ended up paying **** to UPS just to have it packaged for return! Thankfully Overstock says they will accept the return and refund me which makes my story less tragic. As a home reno professional, I get to see many models of shower panels and this one by far is one of the best for the price range. I like it so much I installed one for my bathroom. The only problem is, after a few years, the temp controller starts getting stuck sometimes so it's hard to adjust the temp during your shower as in the beginning. This is the best feature of our master bath renovation. We have had it for 2 years and mY husband still takes 30 minute showers - he loves the body jets! It was easy for our contractor to install and each guy on the crew wanted to know where we purchased it. And the price was so reasonable! Would recommend to anyone who wants a luxury shower. Great versatility in showering options. I don't always want to get my hair wet and I can shower just my body. Jet strength is adequate. Professionally installed.. The dogs gets washed in the shower as well with this and love it. I installed this myself from the copper pipe to screwing it the wall. If your not handy, have a plumber do it. My install was without drywall/cement board, so I was able to place my copper pipes where they needed to go. As long as you measure twice and cut once, this part is easy. Then screw the two hinges to the wall and your done. Now if you have it on a side wall you will be able to see a little plumbing in the bottom but it can be placed in a corner. Works fine almost 4 years later and being used daily. My husband had to remove some kind of metal filters in 3 spots within panel as they kept on clogging monthly and shower panel would loose water pressure. After filters were gone, panel works fine without problems. I love this thing. I was skeptical at first if it would look too futuristic but it looks modern and sleek. Definitaly would recommend having a professional install it though. Love this. Looks beautiful and works really well! Easy to install during the bathroom remodel, but you need really good water pressure to make more than one function work at a time. "The water sprayers are extremely low in water pressure. Is there anything that can be done to mitigate this problem?" Please check the flow pressure. The minimum flow pressure for this unit should be 30 PSI and the Maximum operating pressure is 60PSI. With the factory installed flow rate restrictor, your gpm should be 2.0. If you are in an area with no water restrictors, you may install the flow rate restrictor that was provided in the box and that will increase your gpm to 2.5. "Is this product approved for use in Massachusetts?" Hello Paul69, yes, this can be used in Massachusetts. Thanks for shopping with us! need panel with tub spout included. "My hot water is not hot....how do you adjust it?" Hello jeanmb, you will be contacted by Customer Care. Have a great day. "Does this model have self contained balance control?" Hello JHamm, I hope your day is going well. 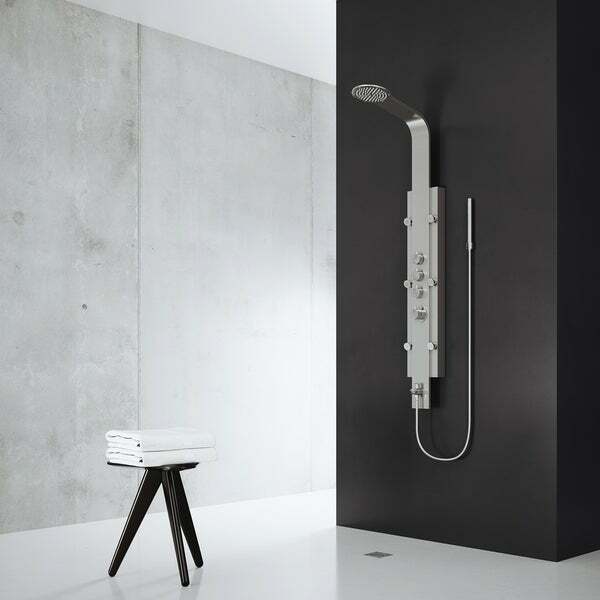 This has a hot and cold integrated thermostatic valve control. I hope this is what you needed; thank you for shopping with us. "I intend to flush mount this and my contractor noticed that there will be a significant space between the wall and the tub faucet part where we will see the bolts and hoses. It is unsightly and we were wondering if there was any trim to cover that?" Hello antandlyd, we do apologize, we do not offer trim for this item. Thank you for shopping with us. "Is the finish more of brushed, shiny or combination of the two? Is there a matching sink faucet to the unit?"